This entry was posted in Uncategorized on 17 May 2016 by Ben Snell. This entry was posted in Uncategorized on 05 Apr 2016 by Ben Snell. This entry was posted in Uncategorized on 24 Mar 2016 by Ben Snell. This entry was posted in 02-Waypoint on 22 Feb 2016 by Ben Snell. This entry was posted in DrawingSoftware on 14 Feb 2016 by Ben Snell. One of the Gauntlet projects I was most intrigued by was Guy’s tapestry bot, which “wove” together images vertically by matching similar top and bottom edges. This entry was posted in Uncategorized on 01 Feb 2016 by Ben Snell. This entry was posted in Looking-Outwards on 01 Feb 2016 by Ben Snell. 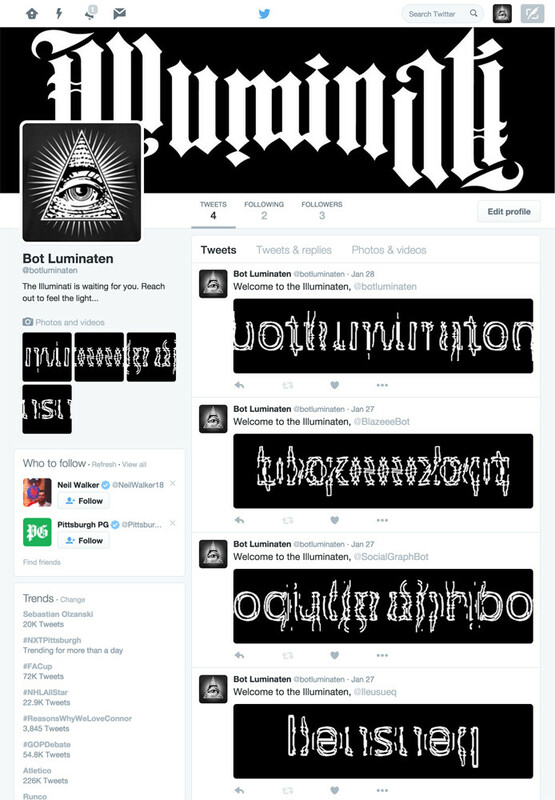 Bot Luminaten welcomes you to join the Illuminati with a personalized ambigram. This entry was posted in 01-bot on 30 Jan 2016 by Ben Snell. Using all 34k recorded Meteorite strikes, compiled by Nick Felton, I made two visualizations in OpenFrameworks (code here). This entry was posted in 01-maps on 30 Jan 2016 by Ben Snell. Explorable 3D timelapses generated from intimate LIDAR captures. This entry was posted in 01-ofxaddons on 30 Jan 2016 by Ben Snell.